By 300 A.D., the Roman Empire had become too large to provide security or manage. As a result, Roman Emperor Diocletian divided the empire into two parts. The western section was called the Latin Western Empire, and the eastern section became known as Greek Eastern Empire. After Diocletian retired in 305 AD, five men contended for the throne for several years. One of them was known as Constantine, and Constantine eventually became sole ruler of the Empire in 324 AD. One of the first things that Emperor Constantine did was move the eastern capital to the city of Byzantium. He did this because Byzantium was a very important port that was strategically located on the Bosporus Strait. Byzantium controlled the sea route between the Black Sea and the Mediterranean Sea. At the same time, it also controlled the trade routes between Europe and Asia. Constantine called his new capital New Rome. However in 330 A.D., as he began rebuilding the city, the people started calling it Constantinople. Today the word Byzantium refers to the state and culture of the Greek Eastern Empire, and the city of Constantinople is called Istanbul. During the 2nd and 3rd centuries Christianity was spreading quickly throughout the Roman Empire. However, at the time many Christians were being persecuted for their beliefs. Rome was considered by Christians to be a pagan city. However, that would all change when a vision converted Emperor Constantine to Christianity. Soon after his vision he made Christianity the main religion of his empire. At this time the patriarch in Rome (the West) became the pope of the Roman Catholic Church, and the patriarch in Constantinople (the East) became the leader of the Greek Orthodox Church. Before long Christianity became the official religion of all of medieval western Europe. Life in ancient Constantinople was very similar to life in ancient Rome. They had chariot races on a track that was very similar to the Hippodrome in Rome. They also had an arena that was similar to the Roman Coliseum. Both cities encouraged races and games as a form of entertainment. Also, architectural designs were very similar, except that the buildings were larger in Rome. 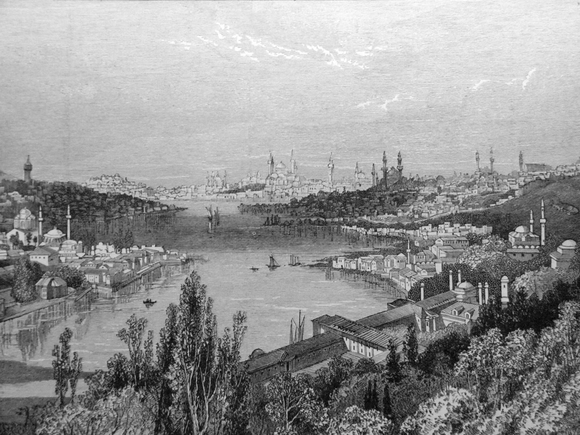 Like Rome, Constantinople became known for its art. Artist excelled in mosaics, ivory carving, enamel work, and metal work. Almost all of this art work was used to adorn church alters and sanctuaries. The Latin Western Empire collapsed in the 400's when it came under the control of Germanic invaders. By the 500's, the Byzantine rulers had expanded into what had once been the western half of the Roman Empire. The best leader of this time period was Emperor Justinian. Justinian wanted to restore the empire to its former glory. He invaded North Africa, Sicily, Italy, and Spain. Justinian also oversaw the construction of the most important example of Byzantine architecture which was the Church of Hagia Sophia. This magnificent building required 10,000 men working five years to complete. Justinian was also instrumental in codifying Roman law. His commission on Roman law created the Digest which was a composition of all cases that served as the basis for their judicial decisions. By the end of the sixth century, the Ottomans were in control of the Eastern Empire. However, before long the Slavs, Arabs, Avars, Turks, and Persians had all conquered parts of the Byzantine Empire, Then in 1453, the Ottomans seized Constantinople which was the last holding of the Byzantine Empire. They changed the name to Istanbul.